Delightful bird 'portrait' painted in oils by watercolourist Liz Angel. 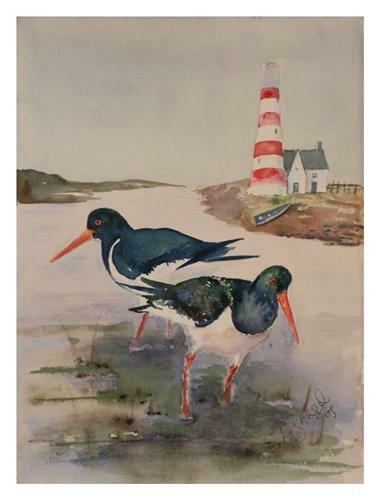 So what do you think - Oystercatcher (Haematopus ostralegus) or Pied Oystercatcher (Haematopus longirostris)? Here's a bit about the artist from her standard bio. Liz Angel, born 1950 in Wolverhampton; ia a popular artist who works in watercolour. Studied at Wolverhampton College of Art 1968-71, obtaining a diploma in Art and Design. Her paintings are in a charming naïve style with people going about their every day life. Many of her subjects are memories of holidays by the sea and of her home town, observing people’s lives, to which she brings the light-hearted energy she manages to create in her paintings. And, to be brutally crass, she sells well (check her out on the Internet).